You will travel nearly 5,000 miles and witness breathtaking natural wilderness, waterfalls and wildlife. Experience the colourful past of the Klondike Gold Rush and the modern society of today. 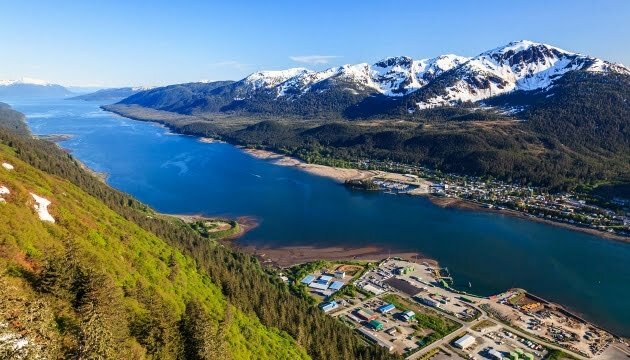 Enjoy it all – a sternwheeler river voyage, a mouthwatering salmon bake, the incredible views of Denali, the natural wonders of Portage Glacier, riding the vintage narrow-gauge railroad, cruising through the Inside Passage and more! All aboard for a Frontier Adventure into Canada’s north and Alaska. Depart Calgary, travel north via Red Deer to Edmonton meeting additional travel companions enroute. Your travels cross central and northern Alberta to the beginning of Peace River country. Continue to Grande Prairie for overnight. Your morning stop is in Dawson Creek, BC. It is here at MILE “0” that the legendary 1,500 mile-long Alaska Highway begins and continues to Fairbanks, Alaska. 2017 marked the 75th anniversary of the world-famous Alaska Highway. Follow the Peace River Valley, an important agricultural and petroleum producing region. The highway winds through a rugged section of the Rockies before arriving into Fort Nelson. This evening features a GET ACQUAINTED WELCOME DINNER. Cross over Summit Pass, the highest elevation on the Alaska Highway as you travel through Stone Mountain Provincial Park. Enjoy a HOSTED LUNCH in a log chalet by the blue-green waters of Muncho Lake. Dip into the soothing thermal waters of LIARD HOT SPRINGS before arriving at the community of Watson Lake in the Yukon Territory. Visit the SIGNPOST FOREST, a collection started by a homesick soldier in 1942 while building the Alcan Highway. If you wish, bring your own sign from home and leave a part of yourself in the Yukon. This morning your route offers spectacular views of the Cassiar Mountains. Cross the Great Divide which separates the waters flowing to the Pacific Ocean from those that flow to the Arctic Ocean. Enjoy a HOSTED LUNCH at Teslin. Make a picture stop at MILES CANYON before arriving in Yukon’s capital for overnight. Whitehorse was a stopover point for the prospectors on their trek to the Klondike goldfields. Visit the SS KLONDIKE STERNWHEELER, now designated a National Historic Site, which sits proudly on the banks of the Yukon River in Whitehorse. (2 nights) Today follow the original trail used by prospectors travelling to the Klondike. Enjoy a HOSTED LUNCH at Moose Creek. Arrive late afternoon for a two-night stay in historic Dawson City, where the famous Klondike Gold Rush started in 1898. This evening try the slots or watch the show at DIAMOND TOOTH GERTIES, a historic casino. Classified as a national historic site, many of Dawson City’s buildings have been restored to reflect life during the gold rush. Gold was discovered at Bonanza Creek near Dawson City, Yukon in August 1896. During the winter of 1897-98, some 100,000 stampeders set out to make their fortune in the northern goldfields. Struggling over the Chilkoot Pass with the mandatory ton of supplies, many arrived at the Klondike after weeks of incredible hardship and adventure. Re-live the excitement of bygone days during your DRIVING TOUR with stops at DREDGE #4 NATIONAL HISTORIC SITE and to PAN FOR KLONDIKE GOLD. The afternoon is free to explore the boardwalks, shop for gold nugget jewellery or attend a recital of poetry written by Robert Service. (2 nights) Travelling west along the TOP OF THE WORLD HIGHWAY brings you through a once-prosperous gold mining area and into Alaska. The highway traverses the mountains above the tree line and offers spectacular views in all directions. Visit North Pole’s “SANTA CLAUS HOUSE” before arriving in Fairbanks for two nights. This morning Alaska’s golden past comes alive during our cruise on the STERNWHEELER RIVERBOAT DISCOVERY with a stop to visit an ATHABASCAN INDIAN VILLAGE. Enjoy lunch and browsing time in downtown Fairbanks. 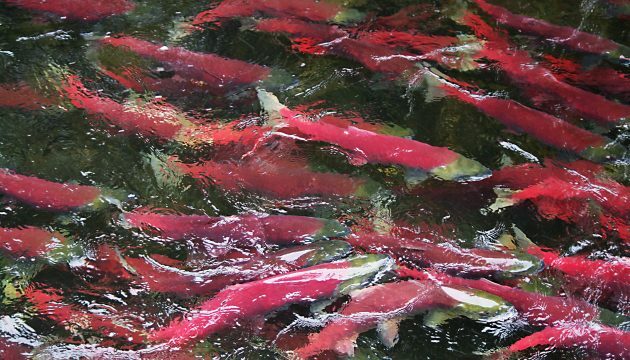 This evening you are in for another treat as our guest to enjoy a traditional ALASKA SALMON BAKE at PIONEER PARK. After dinner proceed to the Palace Theatre for a musical comedy SHOW – an evening of dinner, history and fun. (2 nights) The George Parks Highway offers views of Denali, North America’s highest peak. 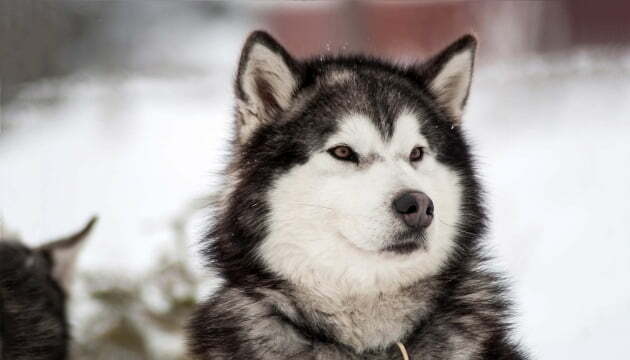 Enjoy a picture stop at the IDITAROD SLED DOG HEADQUARTERS before continuing to Anchorage for a two-night stay. Travel the Seward Highway to Portage Lake and board the MV Ptarmigan for a CRUISE to the face of PORTAGE GLACIER. Return to Alaska’s most cosmopolitan city for a DRIVING TOUR and time to explore the shops, museums and art galleries of downtown Anchorage. Begin your day with an interesting visit to a non-profit MUSK OX farm which is dedicated to the domestication of the “Oomingmak” or “Bearded One”. This animal produces an annual harvest of the finest wool in the world. The scenery will continue to fascinate you on your drive through the agricultural Matanuska Valley to Glennallen. Skirt along Wrangell-St. Elias National Park on the Glenn Highway. Arrive in Tok, home to many sled dog mushers. Enjoy picture stops and a PICNIC LUNCH as you journey through the snow-capped peaks of the Alaska Range to Kluane National Park, home of the largest lake in the Yukon. 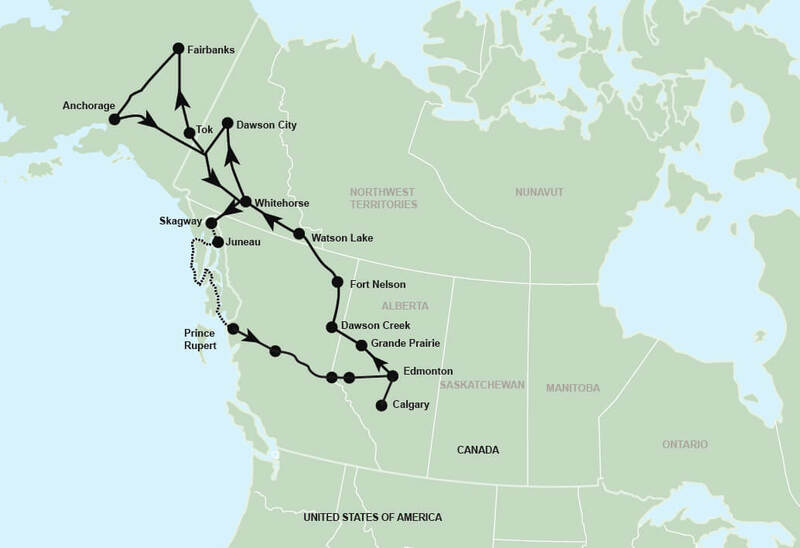 Upon arrival in Whitehorse you will have travelled the entire length of the Alaska Highway. (2 nights) All aboard for a unique ride on the Narrow Gauge WHITE PASS & YUKON ROUTE RAILROAD that takes you from summit to sea level. Carved through some of the North’s most rugged terrain, it offers spectacular panoramic views. Parts of the historic White Pass trail that was followed by the gold seekers in 1898 can be seen from the train. Arrive in Skagway, the boom-town gateway to the Trail of ’98, Klondike Gold Fields and the northernmost point in Alaska’s Inside Passage. Board an Alaska Marine Highway Ferry bound for Juneau for a two-night stay. Enjoy a FREE DAY in this beautiful capital city. Your hotel is conveniently located in historic downtown within walking distance of the waterfront, cruise ship docks, shopping and restaurants. This morning on your area tour of Alaska’s capital, enjoy spectacular views of MENDENHALL GLACIER and the icebergs that dot Mendenhall Lake. Several trails provide access to stunning overlooks of the glacier, the lake and the valley beyond. Board your ferry for a memorable OVERNIGHT CRUISE through the magnificent scenery of the INSIDE PASSAGE. Wake up this morning to the fresh air and natural beauty of the northern outdoors. The Inside Passage is one of the world’s truly remarkable routes. This long sea corridor along the west coast is a glistening water road of unparalleled beauty, contrasts and history which follows the coastline of Alaska and British Columbia. Enjoy the views of tranquil fjords, lush forests, seabirds and marine wildlife. Arrive in Prince Rupert, the deepest ice-free natural harbour in North America for overnight. Today enjoy the scenery while travelling through beautiful British Columbia on your way to Prince George for overnight. With memorable moments of your Alaskan adventure, you make a stop in Edmonton and then continue on to Calgary. ALASKA FERRY:The Alaska Marine Highway System operates the ferries and they allocate sleeping accommodations on the basis of number of travllers. The overnight ferry cabins have two-berths (upper and lower) with full facilities. A limited number of outside cabins are available for an additional fee subject to availability-book early. SIGHTSEEING: Will require occasional walking on rugged and uneven terrain and travellers should therefore be in reasonably good health. 4 Picnic-style Breaks (cookies and juice).